A number of aptitude and ability tests are specifically designed to measure the different aspects of an individual’s crystallized intelligence. Crystallized intelligence is shown through a person’s ability to use prior experience, skills, and knowledge and is drawn from long-term memory. It’s basically a collection of a lifetimes worth of intellectual achievement. It tends to improve with age, as people gain wider understanding, knowledge, and new skills from their experiences. Unlike fluid intelligence, crystallized intelligence can be improved with practice and study fairly easily. While not directly related, there is a correlation between crystallized and fluid intelligence. As an individual draws upon fluid intelligence to solve abstract reasoning problems, that knowledge tends to solidify to improve their crystallized intelligence. 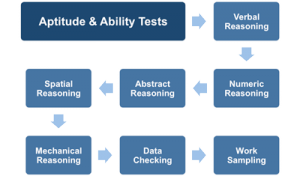 The most common tests used to measure a potential employee’s crystallized intelligence are mechanical reasoning, numerical reasoning, and verbal reasoning tests. They are usually administered under exam conditions and are timed to assess a person’s ability to efficiently solve problems. Mechanical reasoning tests are administered when applying for more specialized jobs such as military roles, craft jobs, technical roles, and emergency services jobs. They focus on mechanical principles and tend to require basic knowledge of electrical circuits, tools, pulleys, levers, springs, gears, and other simple mechanical concepts. Numerical reasoning tests will evaluate your basic arithmetic skills, focusing on topics such as addition, subtraction, division, multiplication, and fractions. If your mathematical skills are a little lackluster, it may be worth brushing up on your basic arithmetic in preparation for these tests. These numerical skills are not only beneficial to employment seekers, but are also useful in many aspects of daily life, from calculating bills and budgets, to weighing out the odds in a game of chance, such as roulette or craps. Practicing these skills can improve many aspects of your day to day life. Verbal reasoning tests assess your ability to identify critical information from written materials and may involve extracting crucial points from documents and reports. These tests will also focus on spelling, grammar, and the ability to follow written instructions.